Abstract. Major revolutions in energy capture have occurred in both Earth and human history, with each transition resulting in higher energy input, altered material cycles and major consequences for the internal organization of the respective systems. In Earth history, we identify the origin of anoxygenic photosynthesis, the origin of oxygenic photosynthesis, and land colonization by eukaryotic photosynthesizers as step changes in free energy input to the biosphere. In human history we focus on the Palaeolithic use of fire, the Neolithic revolution to farming, and the Industrial revolution as step changes in free energy input to human societies. In each case we try to quantify the resulting increase in energy input, and discuss the consequences for material cycling and for biological and social organization. 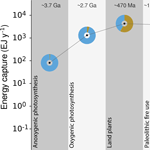 For most of human history, energy use by humans was but a tiny fraction of the overall energy input to the biosphere, as would be expected for any heterotrophic species. However, the industrial revolution gave humans the capacity to push energy inputs towards planetary scales and by the end of the 20th century human energy use had reached a magnitude comparable to the biosphere. By distinguishing world regions and income brackets we show the unequal distribution in energy and material use among contemporary humans. Looking ahead, a prospective sustainability revolution will require scaling up new renewable and decarbonized energy technologies and the development of much more efficient material recycling systems – thus creating a more autotrophic social metabolism. Such a transition must also anticipate a level of social organization that can implement the changes in energy input and material cycling without losing the large achievements in standard of living and individual liberation associated with industrial societies. How to cite: Lenton, T. M., Pichler, P.-P., and Weisz, H.: Revolutions in energy input and material cycling in Earth history and human history, Earth Syst. Dynam., 7, 353-370, https://doi.org/10.5194/esd-7-353-2016, 2016.